Very attractive, soft leather & nice linen. Wish i had bought more. Price was right! 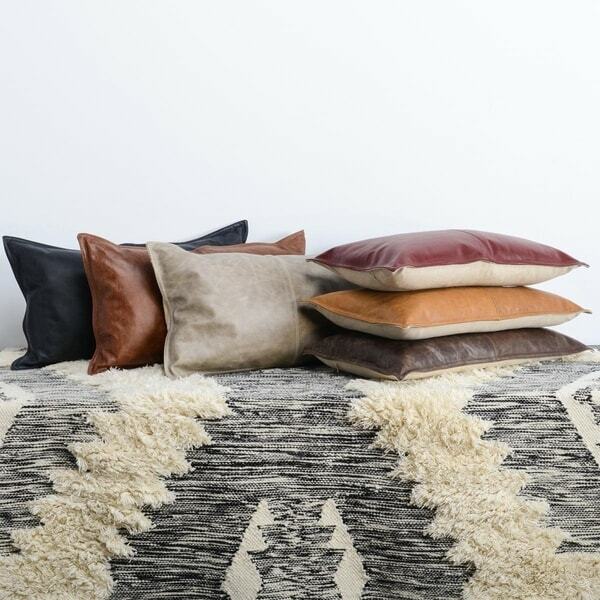 Inspired by earthy tones, this pieced leather pillow features distressed hues that highlights the natural variations of the genuine leather. The pillow takes its inspiration from the timeless modern farmhouse style and celebrates meticulous artisanship with its handcrafted details. Whether as an accent for your living room or a support for additional comfort, you cannot resist the charming appeal of this pillow. Cleaning Instruction: Regular dry-cloth dusting, spot clean or dry clean only. For minor scratches on the surface, use a soft cloth or clean fingers to gently buff the scratch. If needed, moisten lightly with distilled water to work scratches out. Like any fabric, leather can fade if exposed to the sun. DO NOT USE: Saddle soap, cleaning solvents, furniture polish, oils, varnish, abrasive cleaners, detergent soaps or ammonia water. Protect your pillow from sun and direct light. As a material with evolving natural characteristics and variations, the leather will display unique signs of age and use by developing a vintage patina over time. Pillow Fluff Technique: Hold pillow at its edges. Push in pillow towards its center and pull out pillow toward its edges. Repeat the inward-outward movement until pillow feels plump at center. Great quality! Fathers filled pillow, very soft. The pillow cover quality is grade A. I would recommend if you’re are looking for a good quality leather pillow with a fabric side. very nice quality! soft leather front and durable back fabric. i bought leather pillows from pottbarn years ago and this is every bit as great as those. comes with feather down insert. High end product. Product insert is a bit limp doesn’t completely fill out, even after fluffing. I’m ok with it. Pillow does show scratches just like real leather.